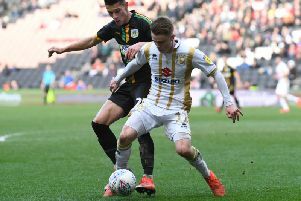 Alex Gilbey's first goals since January fired MK Dons back to the top of League 2 after a 2-0 win over Morecambe on Tuesday night, but injuries marred the night for the home side as Jordan Moore-Taylor and Chuks Aneke hobbled off. The midfielder bagged twice in the second half to see Dons bounce back to winning ways after Saturday's defeat to Stevenage, but Lincoln City's 1-1 draw with Oldham at Boudnary Park means Paul Tisdale's side retake top spot. Concerning though for Dons were the injuries to two key men in Aneke and Moore-Taylor, but they now have 11 days before their next game - at home to Carlisle. After letting slip the lead in the dying minutes against Stevenage on Saturday to slump to only their second league defeat of the season, Paul Tisdale made two changes – Baily Cargill returned from suspension at the heart of the defence, with Mitch Hancox making way, while Conor McGrandles was preferred on the right flank to Callum Brittain. The difference in positions at the start of play – second against 19th – appeared immediately obvious as Dons dominated the early stages, twice coming close through Baily Cargill and Rhys Healey, but it was Morecambe who should have opened the scoring. After a silly free kick was gifted to the visitors about 30 yards out, Andrew Tutte stepped up almost nonchalantly, with Nicholls just getting a hand to it to palm it onto the post. The home side were dealt a blow midway through the first half when Jordan Moore-Taylor hobbled off, forcing a reshuffle as Ouss Cisse replaced him. Dons continued to force the issue, with Aneke and George Williams both having efforts on goal before Tutte too had to be replaced for the visitors – Josef Yarney replacing him before the interval. Agard had scored five-in-five prior to the game against Morecambe, but Izale McLeod's record of scoring in six consecutive games from 2006 would remain as he was replaced by Lawson D'Ath nine minutes into the second half. Having already lost Moore-Taylor in the first half, Dons were dealt another blow when Chuks Aneke pulled up feeling his hamstring, and had to be replaced by Robbie Simpson. The disruption did not seem to affect Dons though as they took the lead within minutes of the change. Picking up the loose ball in midfield, Alex Gilbey scored his first goal since January with a fine right-footed curler, nestling neatly in the bottom corner. The lead was nearly extended from the most unlikely of sources too when Dean Lewington forced Halstead into a fingertip save with a brilliant half-volley from the edge of the box. Morecambe though weren't going down without a fight and buried Dons in their half for long periods, but struggled to really make Nicholls earn his keep. Gilbey though would make sure of the points with his second of the night, firing in from similar range as his first with six minutes to go to send Dons top of the pile.